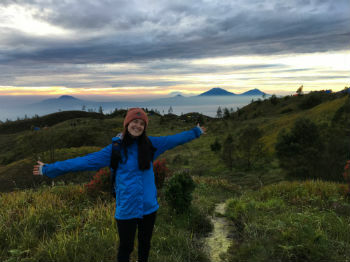 Krystal Buckle undertook an ACICIS Language Immersion Program in Semester 1, 2017 in Yogyakarta, Indonesia. 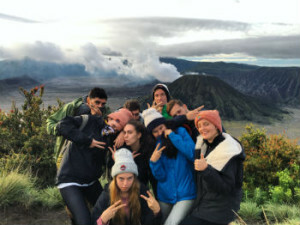 She has written this top 10 for future students travelling to Yogyakarta. Want to go somewhere? Call a Go-jek! Go-jek is one of Indonesia’s best inventions. A taxi app similar to Uber, Go-jek allows its riders to choose between two modes of transport- car and motorbike. Jogja can form some pretty hairy traffic jams, so being able to weave in and out of traffic gets you to your destination faster. Within seconds of ‘calling a go-jek’, a driver will turn up at your doorstep. Costs range between 30c to about $2 per ride! Java is huge. The island is strewn with volcanoes, some active and some no longer smokin’. Being surrounded by volcanoes has its perks- it makes for some great hiking and weekend trips. A volcano in the background! The oiliest, weirdest, fattiest snack ever. Martabak Manis is basically a huge crumpet filled with butter and oil. You can choose your flavours from a long list of things my Dad would probably refer to as ‘a tooth decay waiting to happen.’ But don’t bother, because the only flavour worth trying is cheese and chocolate. I know, it sounds weird but once you take that first bite, you’ll never go back. 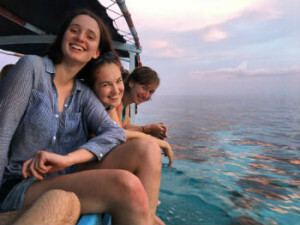 In Indonesia, students mainly live in a Kos. This is like a student boarding house – you can choose the amenities you prefer based on the price you are willing to pay. Staying in a Kos is a great way to meet other students and socialise. However, make sure that you check the curfew time first. Otherwise you could find yourself having to climb the gate… (Yes, I did that). Nestled amidst crumbling buildings and little stalls selling Nasi Goreng for 20c, are hipster, innovative coffee shops! Jogja students love to spend their days drinking coffee and chatting. The café culture in Yogyakarta continues to evolve; this is great for those who love cheap coffee and a nice place to study. True. No matter how hard you try, it is always cheaper to eat out. With such a huge range of food, this is a dream come true for people like me. However don’t expect to escape rice, it’s an Indonesian staple and is eaten during every meal. No nasi (rice)? Then it’s just a snack. Before studying in Jogja, I didn’t even know this was a thing. But in Indonesia, anything is possible. Kelas Kosong basically means that there is no class that week. You can find out that you have a ‘kelas kosong’ from your Uni friends the night before or be like me, and turn up to your 7:30am class and realise that no one is coming. Ahhh. Indonesia operates on a completely different time schedule than what we are used to back in Australia. Jam Karet meaning ‘rubber time’ is a phrase often thrown around. It relates to the Indonesian perception of time, something that is ‘rubbery’ and forever flexible. Basically, if you decide to meet your Indonesian friends somewhere- they’ll either be an hour early or two hours late. After a while, you begin to not get so worked up and start to accept the inevitable. Due to the status of Universitas Gadjah Mada, students from all over the country come to Jogja to study. This provides exchange students with a great opportunity to witness the best of Indonesia- and the thousands of languages and cultures they are a part of. During my semester, I was fortunate enough to meet some people from a village just outside of Padang, West Sumatra. These beautiful people are part of the Minang tribe- the world’s largest matrilineal society (meaning women hold most of the power). Next week I will be travelling to Padang to experience Ramadan with their families and see for myself the deep and fascinating culture of the Minang people. So get out there and get chatting. There is so much to learn from Indonesia. 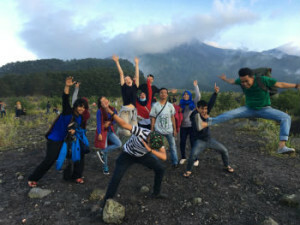 This entry was posted in Exchange, Faculty of Arts, Indonesia, Student Blogs and tagged ACICIS, advice, Faculty of Arts, Indonesia, language immersion program, self-reporting programs, tips, top 10, Yogyakarta. Bookmark the permalink.